The general rule in regard to new growth is that 70% of results are expected at 7 months post-op and 80% at 8 months post-op. After the hair transplant session, the hair follicles are considered to be in a dormant phase from two weeks to 6 months in some cases. Patients can become very anxious during this period as the unnoticeable new growth gradually appears. Some patients will experience growth of a percentage of the transplanted scalp hair without shedding. Hair can actually continue to sprout up even at the 24 month time frame. After scalp hair begins to grow, they will grow at a rate of approximately 1 centimeter per month. Because hair grows at different rates, the new hair growth may be delayed in some cases. 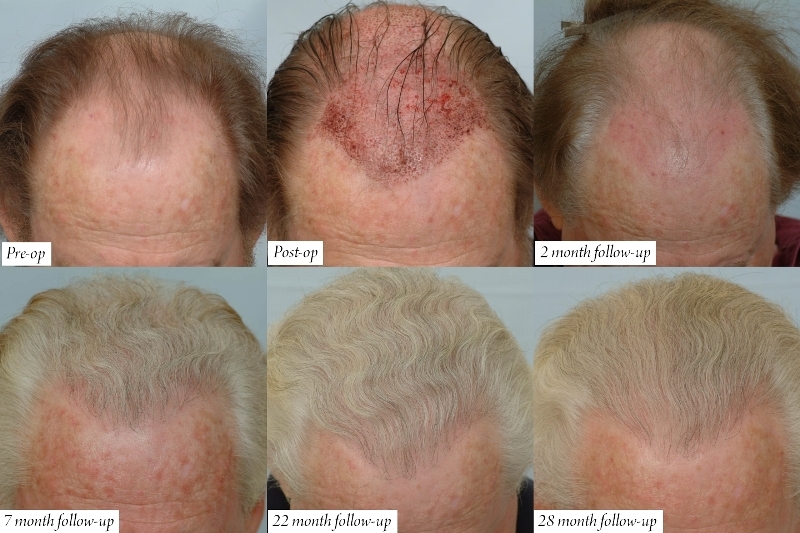 Attached is a collage of a patient who had 3000 grafts transferred to the frontal third and crown. You may be able to see how time affects the transplanted scalp hair. The hair grows in thickness and in length. At two weeks post-op, the scabs begin to fall and shedding of these hairs occurs. At two months post-op, some patients will even experience shock loss which is the shedding of pre-existing hairs. Shock loss is usually temporary as the hairs are traumatized. The traumatized hairs usually re-grow at the 4 month period. At three to eight months post-op, the transplanted hairs begin to grow and may continue to grow from 12 to 24 months. » grow, they will grow at a rate of approximately 1 centimeter per month. » My advice is not medical advice. What about post op care? Can you post Dr. Cole’s post op care instructions? It is interesting to see an older guy. But I guess that goes to show us that hairloss affects us all. Regardless of age we can all share stories of how is has affected us. It makes me glad to see an older gentleman having this procedure. This probably has bothered him throughout his adult life and he can finally be comfortable with his hair again. Listed below are our post-op instructions. After surgery, the transplanted area will be cleaned of blood and crust as best as we can. Don’t touch the scalp until the next day. Wait about 18 hours before resuming any care. You can take a shower (body and donor area only), without wetting the Recipient area. Just be careful because movement could increase the blood flow into your scalp, and also increase the risk of popping the grafts out. You can take a bath but do not submerge the head. Avoid Bleeding and high pressure on your head because it could dislodge grafts!! What could increase my scalp Pressure? Sexual Activity. Stay away for three days. You may do a light workout in 3 days for CIT. Don’t bend over to pick up an item on the ground for one week. Don’t hit your recipient area with direct shower pressure for two weeks. What could increase the bleeding? MEDICATION:- Aspirin, NSAID (Ibuprofen, Motrin, Advil), and Vitamins in general. Stay off for 5 days. CAFFEINE: (Coffee, Coke Tea) tendency to increase blood pressure, therefore increases bleeding. Decrease the quantity you drink. Some outside factors could impair the growth of your grafts. (a)	Direct sunshine exposure for a long period of time. Avoid outdoor activities, or wear a hat and use a strong sunscreen. Avoid sun exposure for 3-6 months. (b)	Smoking. Decrease as much as you can. ©	Swimming pools because of the chlorine. Avoid pools for 2 weeks. IN SUMMARY JUST TAKE IT EASY FOR ONE WEEK. It’s mandatory to wash your hair at least once a day. We also encourage our patients to keep their recipient area moist, (or wet) to decrease the itching and speed up the healing process. Our surgical kit has a special product that you can spray every hour for the following three days, post-op and then you can space that until the product is finished. One week is enough. We have an alternative for those who don’t use the surgical kit. Lather the shampoo in your hand and make it soapy. Apply the shampoo over your head. Just dab it up and down, do not scrub. Dry your hair using a bath cloth (just Dab it) or hair dryer, turned on cool setting. Use a normal saline solution or mixed in a gallon of distilled water, nine tablespoon of regular salt and spray that on your head. This is for the first week. Repeat the same events the second week. But you can start massaging your scalp with fingertips while applying the shampoo. It helps the scabs to fall off. After the second week you can go back to regular shower and we recommend you rub the scalp aggressively to remove the remaining scabs. Be aggressive the next day after the procedure. Rub the area with the shampoo and hit with a good shower pressure to rinse it. After drying the area, apply a layer of Bacitracin or Neosporin for two to three days. In strip case, we have (absorbable or dissolvable) sutures that will fall off on their own around 3 to 4 weeks post-op. You or we can still remove them after 12 days if it’s bothering you. Day 1: You may have some oozing and pain. Just apply pressure with a bath cloth for 15 minutes. FOR PAIN: We have prescribed Vicodin (pain killer) and you can apply an ice bag – 20 minutes on / 20 minutes off. Day 3 Post-op You may have some swelling in the forehead and eyes. Sleep in 45 degree angle or your head elevated (it helps the liquid drain backward) if you are able to. If not, do not worry about it. Your scabs will turn brown w/ crust on it. Day 7 Post. The scabs will start to fall off, and this will occur during two weeks. The scalps usually turn red, due to the inflammation and blood activity. It can last one month or more in some patients. 3 Months Post-op. The first Growth. 9 Months to 1 year Post-op: Full benefits of your surgery in term of cosmetic and growth. Vicodin .5mg. 2 Pills by mouth as needed. Start just after the procedure. Don’t do anything that will require you to be alert. Driving, manipulating sharp instruments. (b)	Tylenol extra strength 2 Pills, 3 times a day. For minor pain as in CIT. ©	Sleeping medication. Ambien 10 mg. As needed. (e)	Rogaine: Vitamins for hair. Wait three days before you restart your treatment. NB: Any medications that you take which are not vital or necessary stop them prior to your procedure and restart those 3 to 5 days after the procedure. ***You may have your first haircut or color/dye your hair 14 days after your procedure. Do not shave your head with a razor for at least one month. » » grow, they will grow at a rate of approximately 1 centimeter per month. » » in some cases. » » transplanted scalp hair. The hair grows in thickness and in length. » » My advice is not medical advice. You are absolutely correct in regard to this patient’s new level of confidence. In this case, it is apparent that the outcome of the procedure is a direct result of a life changing experience. In my experience, patients from all different ages are psychologically affected by hair loss in some form or fashion. To witness each patient’s joy first-hand is a privledge that we desire most.